Lee & Low Books, 9781620142608, 40pp. James Van Der Zee was just a young boy when he saved enough money to buy his first camera. He took photos of his family, classmates, and anyone who would sit still for a portrait. By the fifth grade, James was the school photographer and unofficial town photographer. Eventually he outgrew his small town and moved to the exciting, fast-paced world of New York City. After being told by his boss that no one would want his or her photo taken "by a black man," James opened his own portrait studio in Harlem. He took photographs of legendary figures of the Harlem Renaissance--politicians such as Marcus Garvey, performers including Florence Mills, Bill "Bojangles" Robinson, and Mamie Smith--and ordinary folks in the neighborhood too. Everyone wanted fancy portraits by James Van Der Zee. 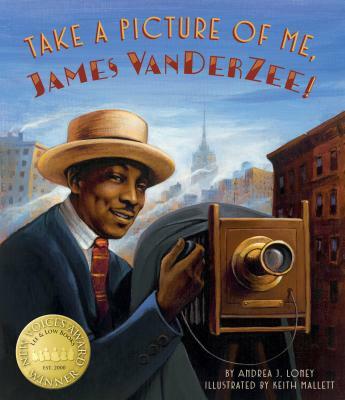 Winner of Lee & Low's New Voices Award, Take a Picture of Me, James Van Der Zee tells the story of a groundbreaking artist who chronicled an important era in Harlem and showed the beauty and pride of its people.